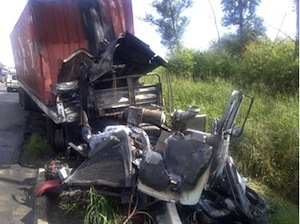 Anaheim Truck Accident Injury Lawyer – More Than Three Decades of Litigation Expertise You Can Trust! Are You Looking for a Truck Accident Injury Lawyer in Anaheim, California? The huge size of a semi truck traveling at a high speed can result in a devastating accident with debilitating injuries. Unfortunately, there are many trucks on our roads that are being manned by tired, inattentive and negligent drivers, who place motorists at a high risk. If you or your loved one has been involved a truck accident in Anaheim, or if you have a wrongful death claim due to death of a family member in Anaheim or anywhere in California, you need to contact an experienced truck accident injury lawyer and law firm. Our experienced personal injury and truck accident injury attorneys and legal team can help you pursue your rights and obtain maximum compensation for your injuries, as well as for emotional, or financial losses. Please visit our Truck Injury Accident Web Site to learn more about the truck accident injury claims process and please call us for a FREE case evaluation about your specific truck accident or other injury accident case. Anaheim is a city in Orange County, California. As per the 2010 United States Census, Anaheim had a population of 336,265, making it the 10th most populous city in California and the 54th most populous city in the United States. In a city this size, road accidents are widespread. Distracted, negligent drivers, all add to the number of truck, car and other accidents on roads in Anaheim. Our experienced truck accident lawyers will advise you on all the aspects of injuries or wrongful death claims, and offer effective, aggressive representation and administration of justice in the event of a truck accident or other injury claim in Anaheim or anywhere in California. Tremendous experience in resolving personal injuries inflicted and wrongful death cases throughout Anaheim, Orange, Los Angeles, the San Fernando Valley, Ventura, San Bernardino and all of California. We have more than 40 years of legal experience in handling truck, car and motorcycle accident injury claims, personal injury and wrongful death cases throughout Anaheim, Orange, Los Angeles, the San Fernando Valley, Ventura, San Bernardino and all of California. To learn more on how we can assist you further, and what you need to do to protect your rights and to comply with special time and other procedural rules and deadlines, please call us at 1-866-INJURY 2 or 866-465-8792 or 818-222-3400 (after hours, press 1) for a FREE, no-obligation consultation. Moreover, you can simply email us at info@WalchLaw.com, or just fill-out our easy contact form and find out what your options are and what you need to do to protect your rights.